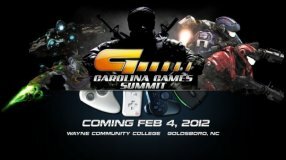 The Carolina Games Summit will host ShootMania Storm, Gears of War: Judgement, and Ghost Recon: Future Soldier benefit tournaments at the East Coast Game Conference with 100% of the proceeds benefiting Child?s Play Charity. The Conference is being held April 24-25th at the Raleigh Convention Center in North Carolina. The tournaments will be held in the Exhibition Hall and will span both days of the event. Registration for the tournaments is free to all conference attendees however a small donation to Child?s Play Charity will be required upon arrival. Tournament registration is currently available at www.CarolinaGamesSummit.com/tournaments.php and will continue on site at the Child?s Play booth in the exhibition hall. The ShootMania Storm FFA Royal and 3v3 Elite tournaments will be held on Alienware x51 desktops with BenQ XL2420T 24? LED displays and Plantronics GameCom 780 7.1 Channel headsets, the official computer , monitor, and headset of the Carolina Games Summit. The Ghost Recon: Future Soldier Guerilla Mode score tournament and Gears of War: Judgement 4v4 tournament will be held on XBOX 360 consoles with BenQ XL2420T 24? LED displays customized with FPS presets and Plantronics GameCom X40 headsets. In 2003 Child?s Play was organized, which is a game industry charity dedicated to improving the lives of children by providing toys and games in the charity?s network of over 70 hospitals worldwide. Over the years, you as a community have answered the call and come together to raise millions of dollars. The term ?record-setting? doesn?t do the final total justice, nor does incredible, amazing, generous, or overwhelming. In 2012, Child?s Play Charity raised over 5 million dollars for children across the globe.